Also known as the Maori wrasse, Napoleonfish, So Mei, Mameng, or Napoleon wrasse; the humphead wrasse is found mainly in the coral reefs in the Indo-Pacific region. It is the largest living member of the Labridae family, as males reach up to 2 metres long and females can grow up to 1 metre long. However, some male humphead wrasses can grow as large as 2.29 metres long, and weigh 190.5 kilograms! 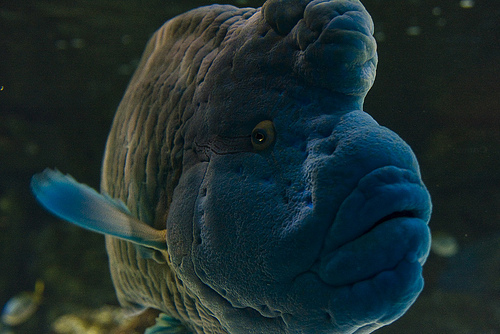 Like other wrasses, the humphead wrasse is known for its wild colours. Males can have bright electric green to blue, purplish blue, or dull green or blue scale colours. Females and juvenile males can be red-orange in colours. 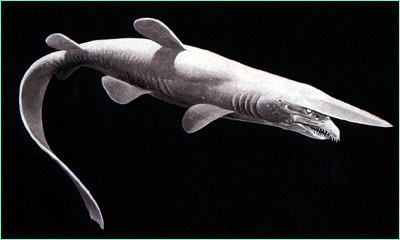 It has fleshy, thick lips and a hump on its head that becomes more prominent as the fish ages. 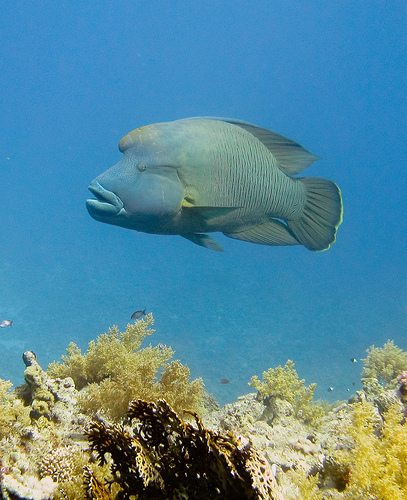 Adult humphead wrasses can be commonly found in channel slopes, coral reef slopes, and lagoon reefs in depths of 1-100 metres. They are usually found in a male-female pair, or groups of up to 7 individuals.They are opportunistic feeders that prey mostly on mollusks, crustaceans, echinoderms, and fish. They are also a predator of the toxic sea hare and box fish, and have even been reported eating on the crown-of-thorns starfish. Although the humphead wrasse has a long life, it has a very slow breeding rate. As a result, its population has vastly declined due to numerous threats. These threats include spearfishing at night with SCUBA gear, invensive removal of live reef food fish trade, destructive fishing techniques such as using dynamite and sodium cyanide, habitats being lost or degraded, juvenile humphead wrasses being captured and raised until they are a saleable size, export markets for juveniles for marine aquariums, and a lack of coordinated and consistent regulation so illegal fisheries take place. Historically, this fish was prized for its texture and flavour. Some consider the humphead wrasse to be a royal or stately fish and was once highly valued in many cultures. It was also only used for special occassions or only exclusively available to “highly ranked members of Society”. Sadly, more recently, the live reef food fish trade which is centred in Southeast Asia at times commands over USD$100 per kg for this fish at retail and is the most highly priced fish of any species for international trade. In Hong Kong, which is the largest known retail sector for the humphead wrasse, are less than 60 cm long. This means that they are all juveniles and this will no doubt threaten the status of this species. Since December 2003, Australia has prohibited the take and possessin of the humphead wrasse except for certain educational purposes and for public display. Guangdong province in China requires permits if humphead wrasses are sold. Indonesia only allows these fish to be used for research, mariculture, and licensed artisanal fishing. In 1995, the Maldives banned this fish for export. Papua New Guina has prohibited the export of this fish that are 65 cm long. 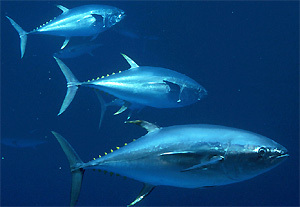 Niue has banned all fishing for this species, regardless of what it is for. The U.S. National Marine Service categorises the humphead wrasse as a Species of Concern. This means that they are concerned about the threats and status to this fish but they do not have sufficient information to make sure that it stays on the US Endangered Species Act. 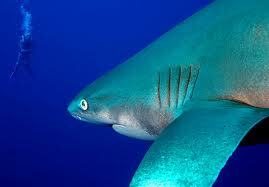 This fish was listed by the IUCN as an vulnerable species in 1996. However, it now is endangered.